Paddling in the Upper Peninsula isn’t really a silent sport. You’ll hear the thunder of waterfalls, rush of rapids, call of loons, whisper of breezes or howl of wolves as you ply our waters. First time paddlers can ease their way across mirror smooth lakes and down lazy rivers. Avid paddlers can brave the Class IV whitewater rapids of Piers Gorge on the Menominee River. Plummet down a 10-foot waterfall and ride the churning waves between canyon walls. Or take a guided tour along Lake Superior’s colorful sandstone cliffs known as Pictured Rocks. It’s unforgettable. Do yoga on a stand up paddleboard by the ancient shores of Mackinac Island. Glide over three visible shipwrecks off Drummond Island. 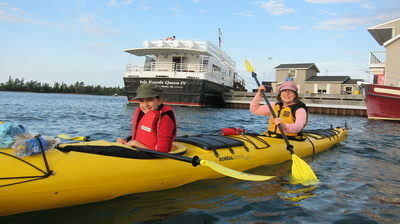 Join family or friends for a short paddle out to Lake Superior on the Two-Hearted River. Or plan a long adventure on the Lake Superior Hiawatha Water Trail from Munising to Marquette to Big Bay in your sea kayaks. Bring your own paddle craft or rent while you’re here. In spring our waters run fastest. But the beauty of summer and fall will inspire you to try new waters tomorrow.